This PR added a feature to show/hide filter bar for the filter_bar component using a similar button in the sidebar. Since this is a community submitted pull request, a Jenkins build has not been kicked off automatically. Can an Elastic organization member please verify the contents of this patch and then kick off a build manually? Hi @aaronoah, we have found your signature in our records, but it seems like you have signed with a different e-mail than the one used in yout Git commit. Can you please add both of these e-mails into your Github profile (they can be hidden), so we can match your e-mails to your Github profile? Sorry. I've included my email to it. Hi guys! I'm open to any comments on this PR, feel free to give me some feedback and I'll try to improve it. Hey @aaronoah, sorry for the silence, we'll take a look at this as soon as we can, we're just spread a little thin at the moment. I may be missing something super obvious here, but where is the button? the ng-hide class seems always applied, filters or no filters. The feature is that when the last number of filter pill extend to the next row, the icon will appear. Only when there are multiple rows will it appear. 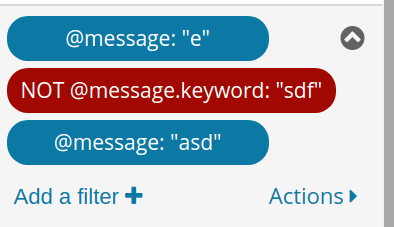 Functionality works well imo, thanks! Hoping we could avoid importing a copy-paste of an existing icon. ng-class="filterNavToggle.isOpen == true ? '' : 'filter-nav-link--close'"
Originally I thought I should use a similar icon on the app-switcher sidebar. It makes sense to avoid duplicates. I will switch to font-awesome. My suggestion would actually be to put the arrow on the left side of the filter bar and add padding to the filter bar only when the icon shows up. This will also fix the icon from jumping around the UI from collapsed to uncollapsed view. @cchaos It's a good suggestion when I try to do this feature. Though putting the icon on the left avoids jumping of the icon, I realize that it might be weird to add padding to the icon when filter pills grow to multiple rows and will trigger re-layout of all the pills. @aaronoah I see the issue there. Then what I would do is move it to the far side of the filter bar and have the Actions button stay on the left since it shifts to the bottom of the bar anyway. This will keep the collapsing button in a permanent spot so users don't have to move their mouse to re-collapse. If outlined how I would do it below. Change to width: calc(100% - 80px). At 90%, there is still the chance of overlap. No longer need this to accommodate the action button. yup in agreement with @cchaos , thx @aaronoah! thanks for the modifications @aaronoah! I think we probably should avoid the overlap. when the filter-bar is collapsed, it isn't very clear to the user that there are actually missing filters. imho it would make sense to add some text/feedback that filters are missing. Perhaps next to the expand-icon, something like ... expand to see all filters (v). Feel free to make other suggestion here, I'm not 100% sure what the best approach would be. I'd consider that it might be rare for users to make the width of a window too small, which also makes some part of search bar invisible. So I propose to add min-width to the filter bar so that it won't resize under the limit. I propose to replace tooltip texts "Expand filter bar" with "Expand to show filters" and "Collapse filter bar" with "Collapse to hide filters" for conciseness. If something does not work out, let me know and I can try to search for other approaches. @aaronoah, agreed on both counts. Adding min-width . Yup, I'd put it in. @cchaos, do you agree? OK with renaming of texts. it seems we're good to go then for (1). Maybe we can still do the rename of (2) for clarity. In the output, I saw some weird issues from moment.js and some unhandled Promise rejections that do not relate to this PR. I will try to find some ways to resolve it. I think there are too many commits after this PR in the master branch, so if I reset my commits and rebase on the latest master and apply this PR again, it might solve the problem.